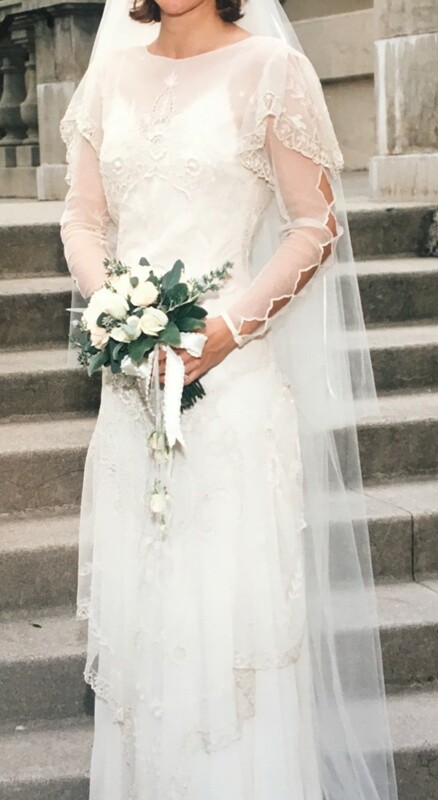 I am selling a full-length, custom, hand-made, ivory lace wedding gown designed and made by Susan Lieberman with the slip that goes underneath. The dress was purchased from Lieberman's beautiful, historical store-front boutique in Santa Monica, California called Paris 1900, which recently closed after 30 years. The owner/designer traveled all over Europe and the United States for purchases, exploring antique shops and following private leads to find her collections. The dress was worn in 1995, cleaned and stored in an archival, acid-free box. The size is approximately a 4-6. I was 5'7" and 125 when I wore the dress. It measures approximately 59" long from shoulder to floor, 21" shoulder to cuff, 32-34" bust, 28-30" waist, 34-36" hip. The top of the dress is sheer lace which overlays a double-layered, flared, silk chiffon skirt. The back of the dress dips to a "V" and has a row of tiny buttons, and cream-colored silk chiffon flowers that sit at the bottom of the "V". The shoulders have a lace overlay, with delicate diamond cutouts down the sleeve and close with a tiny button at the cuff. There is a spaghetti strap slip to wear underneath. The details of the lace are delicate and exquisite. It is a beautiful, one of a kind dress in great condition.